It’s been nearly three years since we saw the reprint of shock lands. In other words it’s been three years since dozens of MTG speculators invested in fistfuls of the Modern dual land – it was the beginning of a long, arduous journey…a journey with few bumps and even fewer profits. If bonds are seen as safe, unexciting investments then RtR shock lands are the epitome of MTG bonds. Except, with shocks there were no distributions or dividends. Naturally, when Khans of Tarkir brought us the Onslaught fetch land reprint, many financiers, myself included, were leery of the investment opportunity. Could this be another shock land debacle? Would fetches be reprinted again and again in subsequent sets, making all prospect of profits virtually absent? I’ll be first to admit I thought the answer to these two questions was “yes.” Acting cautiously as always, I limited my exposure to Khans fetches to no more than around twenty copies. When I shifted focus towards a portfolio refresh via massive liquidation at GP Vegas, I unloaded the vast majority of my Khans fetches. Fortunately, I made a handy profit on this pursuit. Unfortunately, I missed out on additional gains. Why cant i read this i am a pro trader subscriber!! I am afraid I can’t help there. :(. Did it automatically log you out, perhaps? I know the site had some issues yesterday too so that could also have been a variable. Hey what do you think about Original Dual lands, last time the fetches hitted a spike, the price of duals jumped a week later. This is a terrific question, and I wish there was an easy answer. I rode the “Dual Land” wagon for upwards of a year expecting Modern spikes to filter into Dual Land price increases. That hasn’t really happened yet. And when I look at SCG’s stock on something like Underground Sea, I see they have dozens available. This data makes me inclined to expect no real price movement on Duals in the near term. Then again, SCG’s prices on these are very high relative to the open market and their buy list prices are quite low. Your best bet will be to watch stock on TCG Player to see if the numbers dwindle. Until we see a trend there, I don’t expect much movement in Duals. 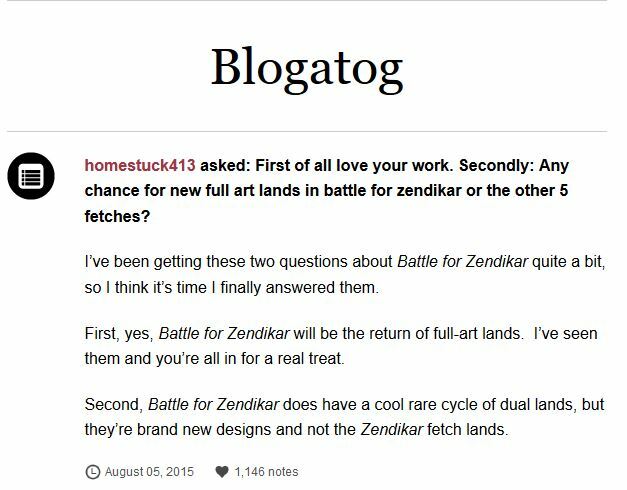 A year ago I would have answered this question differently, but there are a few headwinds for Duals now (specifically Revised ones) – threat of counterfeits and significantly less Legacy SCG coverage immediately come to mind. We may see a leg higher eventually…but not imminently. What would be a good time to get out do you think? For me personally i bought 4 tarns at 32 and i mesa for 20 a few months back. I am trying to decide if it would be a good idea now to trade into revised duals or sit on them for another month? If you are eager to take some profits on your well-timed buys, I would not fault you one bit. I’m ALWAYS a fan of taking easy gains when I have them. That being said, other than the settling post-buyout, I don’t see any real reason for fetches to drop from here. Demand may fizzle a little bit as we head into the fall, but the respite would be short-lived. Modern season comes again in a few months, and demand should remain strong at that point. If you’re after financial gain, I may be inclined to recommend sitting in your fetches vs. moving into Duals. If you NEED Duals for play, then by all means take advantage of the favorable exchange. You won’t regret it 1-2 years from now when these fetches are inevitably reprinted. At the moment I do not really need either the fetches or the duals. But I worry about missing my window on my profit and i know that the duals should always hold their value. Currently I am looking at getting 2 revised tropical islands for the 5. Until I read your response o n the previous comment I had not considered the downside of the counterfeit cards on my revised dual prices. Might make more sense to trade into unlimited copies. Thoughts? I started investing in playset of every viable card in Modern. While some losses have been sub stained, more has be gained. Minus the unfortunate of being able to acquire a last Scalding Tarn, I picked up a playset of all the Zendikar fetches, with the inclusion of a foil March Flats and a foil Verdant Catacombs. Still salty of not getting my last tarn though. I didn’t expect the quote/unquote “Pipebomb” dropped about the fetches not being reprinted. When MM 2 was reprinted, even though Innistrad was announced as not being included, this didn’t affect the price of Snapcaster mage, a huge, HUGE staple of Modern and also a favorite in Legacy for a few weeks. The market didn’t catch fire this fast. Same with Horizon Canopy, Goblin Guide, Blood moon, Inquisition of Kozelik, and the list goes on. The set was spoiled and it still took weeks for a lot of these played cards to spike in price. Even as popular as the Zendikar fetches are, the price spike was ridiculously fast. So why is it that it took weeks, for all these other cards to spike versus the fetches jumping up in the ranges of $15 to $40 in the matter of a week-ish timeframe? It is simple, the Modern and Legacy demand. Even though the cards I listed before are played, some heavily played, fetches might as well be the most non-basic played card in magic currently, and second only to the good ole’ bolt. Yes Legacy too, they equally abuse these lands. So my theory is the second the “no reprint” spoiler dropped, it caught fire among the secondary market fast, and prices jacked due to supply vs demand. Scalding Tarn has spiked nearly…$37?, and honestly, I don’t think these lands will hit the glass ceiling yet on prices. 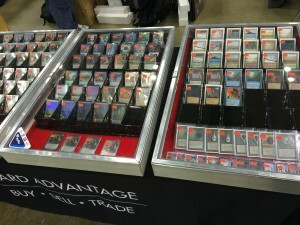 Look at the Onslaught Fetches before the reprint… Polluted Deltas were over $100? So why no reprint? Well, this also boils down to the secondary market, and how recent we had Onslaught fetches reprinted. Does WOTC really care about the secondary market? That hard to say at times, but, if they did reprint both sets of fetches, it would hit gaming stores, venders, and sellers that make a living off of selling singles like a wrecking ball (no pun intended). If we look back, there was a time a few years after the Zendikar fetches were released, where they could still be purchased for $10 to $15. The prices began to spike slowly over time. That was a lot to write but there is a point to all of this. My point is, Shock lands are still viable pickups. A few years have passed since the reprints, so now is still a good time to pick up playsets, in my opinion. They are still played all over in Modern. It will take time granted, but give it a year or two and if no other reprints happen, I am sure the increases will be to accumulate over due time, Just as the Fetchlands did. Yes this is an article about the Zendikar Fetch price spike, but someone mentioned shocks, so this directly correlated to that. Wish i could edit this, noticing a lot of typos. I really appreciate your thorough comment. I don’t mind the typos one bit – believe me, I wish I could take back some comments or edit some typos sometimes as well. Your point came through. Shock Lands – good old Shock Lands. These have moved SO painfully slow, that I finally decided to abandon them in favor of other investment opportunities. In reality, picking up any Modern card that’s played just as much and is OLDER than Shocks would have been a better play. Scars Lands, Filter Lands, Manlands are all spectacular examples. And these will go higher even still – being older means there are also fewer copies out there. So even today, looking forward, I have to imagine something like Filter Lands or Scars Lands will have more upside than Shock Lands…at least until any of the above are reprinted. What do you think of this hypothesis in general? That Shock Lands may be a fine investment, but there are better targets out there? The concept just popped into my mind naturally while replying to your comment (this is the tremendous value of others’ comments). I agree that we haven’t hit a ceiling on Zen fetches yet. I was so paranoid about reprints that I neglected the fact that there was far more GAINS to be made from non-reprinted stuff than there was money lost from the reprinted cards. This is a reflection of my risk aversion, as well as a lack of respect for the format as a whole. Clearly the format is working and growing, and a diversified portfolio of Modern staples could be a very solid investment strategy going forward. Perhaps I’ll take advantage of the off-season to pick up a few more key targets. Great build, and I really appreciate the insights. You’re helping me evolve my own thinking about how to approach Modern. It is no Problem. Investing in Man-lands is equally as good, as well as fast lands in my opinion. Picking up Creeping Tar Pits, Raging Ravines and the other Man Lands are solid, I was happy to see the spike in some of the Fast lands move up a bit. At first the reprint scare did have me going, but I went with my guns on that we would see new man-lands, as in the enemy man-lands, or even the filter lands in BFZ, which i would love to see man-lands. The Shocks have been a hit/miss scenario, and the lack in price rise has at times also been saddening, but i still have faith they will start to creeping up in the next year to two years with no reprints. I began my Modern Portfolio as a Toolbox project initially to have access to any modern build and any playset. After I realised that due to constantly flying around (which is my day job), I would not have the time to play competitively, so I began instead focusing on the finance side of it more, along with deck tech and limited strategy, which is more of what I enjoy anyways. I still continue to push to complete it, and there is a ways to go. With GP OKC coming up, there maybe a large chance of knocking that out. I realised that having even uncommon and common sets of Modern, and Legacy staples have benefited more that costed me for trading. At this point I may even do a best of commander binder just because there is a large majority of players that love that format, as do I, when time permits to grab a few games. Right now, with BFZ right around the corner, I’d recommend getting Eldrazi stuff while they are at an all time low thanks to MM 2. Eye of Ugin’s, Kozelik’s, Ulamogs, and the fun stuff, and even sets of things like sets of Twin, Fulminator mages are just good low pick ups that will benefit in the long run. The last things ARE the current man lands, which minus celestial, i have acquired multiples of. With that particular one not seeing a lot of play lately, would have though the price would have dropped on it a bit…. but it has stayed at around $20. I have a feeling for seeing new man lands in BFZ, as in the enemy ones. I do not know whether they will reprint the current ones. They had all ten shocks in Standard at one point so I suppose it is possible, but unlikely. I am slightly hesitant on picking up filters, but still look to get them since I think those strike less of a chance, at least for this block. I know I am being a pedant but I see this all the time in MtG writing and today I have epfelt compelled to comment. Wary: a different word than weary.